This is a list of the evolution of the borders of the United States. This lists each change to the internal and external borders of the country, as well as status and name changes. It also shows the surrounding areas that eventually became part of the United States. Each stage has a map, to show what the specific makeup of the country was at any given time. After achieving independence with the Massachusetts, North Carolina, Texas, and Virginia, lost land, in each case to form new states. Nations under Compacts of Free Association: Marshall Islands, Federated States of Micronesia, Palau. Unincorporated, organized territories: Guam, United States Virgin Islands. American Samoa is unincorporated and unorganized, but has a constitution and self-government, making it functionally very similar to an organized territory. The former unincorporated territories of the Line Islands, Panama Canal Zone, the Commonwealth of the Philippines, and the Phoenix Islands. The Trust Territory of the Pacific Islands, a United Nations trusteeship granted to the United States following World War II. It has since dissolved, becoming the Marshall Islands, Federated States of Micronesia, the Northern Mariana Islands, and Palau. Various unincorporated territories whose claims under the Guano Island Act have been abrogated by the United States Government. "Palmyra Atoll is the only remaining unorganized incorporated U.S. territory. Dotted lines on the borders mean that region is part of a country not fully shown on the map, which is confined to the present-day borders of the United States. An exception is Oregon Country, which was shared land which extended beyond the area of the map. Several very small changes are included in the list but not included in the maps. The switch of two extra counties from Virginia to West Virginia at the end of the American Civil War. The Alaska Boundary Dispute, since it arose from a total lack of surveying, rather than a dispute over the surveyed lines; it would also appear quite small on the map. When the Dakota Territory was created, it also included land south of 43° N and north of the Keya Paha and Niobrara rivers. This was transferred to the state of Nebraska on March 28, 1882. The two small adjustments to the Indiana Territory. Various disputes along the Rio Grande with Mexico. Ratification of the Constitution, Confederacy formation and reconstruction are simplified to make the map simpler. Other small territorial changes, such as minor adjustments to state borders or transfers of small amounts of territories between states (such as Boston Corner, New York) are also not shown on this list. The United States Constitution came into effect, forming the new nation. 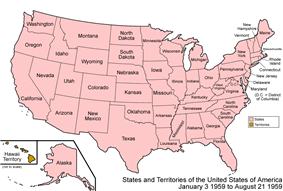 Note that the states ratified at different times, but to simplify the map, the final result is shown here. The United States achieved independence from the Kingdom of Great Britain with the Treaty of Paris on September 3, 1783, which established that the thirteen colonies were sovereign and independent states. The borders were established by Article 2 of the treaty, but with a couple of issues. First, it stated that the border would run west from the Lake of the Woods to the Mississippi River – at the time, it was not known that the headwaters of the Mississippi lay south of such a line, so the border has since been taken to run south from the lake to the river. Some peculiarities to point out to those familiar only with the current borders: Many states had North Carolina also ceded its claim to its western counties, but this was not officially accepted by Congress until 1790. New York ceded its claim on the Erie Triangle to the federal government. At this point in history, all of the states except for Georgia and Virginia were at their present-day borders, except for some of the minor issues mentioned above. West Florida claimed a border farther north than what the United States said it had. Its border had been 31° north when Spain ceded it to the Kingdom of Great Britain in 1763. The British later moved the border north to 32°38′ latitude, but when the Floridas (East and West) were ceded back to Spain in the Treaty of Paris, the British cited the original border at the 31st parallel north. Spain continued to claim the more northerly border. Also, the borders at the northern area of the Maine District of Massachusetts and the area northwest of Lake Superior remained disputed. The Wedge, disputed since the 17th century, remained a point of contention between Delaware and Pennsylvania. The Vermont Republic was a complex matter, with areas being claimed by New York and New Hampshire, but it existed as a de facto unrecognized independent state. The United States Congress affirmed the organization of the Territory North West of the Ohio River, or Articles of Confederation on July 13, 1787, and was slightly modified under the new Constitution. Growth of a Nation: Ten minute presentation illustrating the growth of the United States from the original 13 states. 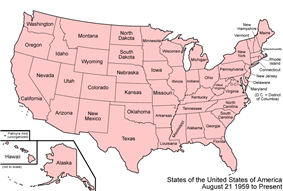 States of the United States from Statoids.com. The 50 State Quarters Program at the United States Mint, listing dates of statehood. Acquisition Process of Insular Areas – lists all insular areas. Manifest Destiny Interactive version of this article. The small town of Rio Rico, Texas, was ceded to Mexico in the Boundary Treaty of 1970, along with Beaver Island, near Roma, Texas. The handover officially took place in 1977, and the town was added to the Mexican state of Tamaulipas, of which it had long considered itself a part. See Mexican Boundary Exchanges. The Chamizal Dispute with Mexico over about 600 acres (2.4 km2) on the U.S.-Mexico border between El Paso, Texas, and Ciudad Juárez, Chihuahua is resolved. It was caused by differences between the bed of the Rio Grande as surveyed in 1852 and the channel of the river in 1895. Hawaii Territory was admitted as the 50th state, Hawaii, resulting in the present-day situation of the United States. The statehood act specifically excluded Palmyra Atoll from the new state; it thus became unorganized land. Since it had been incorporated as part of the Hawaii Territory, Palmyra Atoll became the only incorporated territory left in the United States. Alaska Territory was admitted as the 49th state, Alaska. The dispute over a square mile between Delaware and Pennsylvania, The Wedge, is finally resolved in favor of Delaware. Arizona Territory was admitted as the 48th state, Arizona. 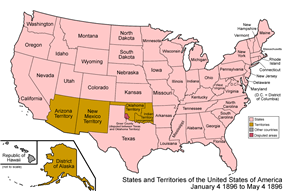 New Mexico Territory was admitted as the 47th state, New Mexico. 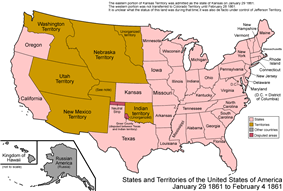 Oklahoma Territory and Indian Territory were combined and admitted as the 46th state, Oklahoma. Present day states and future states now have current borders. The Alaska boundary dispute is resolved by arbitration, generally favoring the American claim. The annexed Hawaiian islands were organized as the Territory of Hawaii, and corresponded, except for including Palmyra Atoll, to the present-day state of Hawaii. The Republic of Hawaii was annexed by the United States. A Supreme Court ruling officially assigns Greer County to Oklahoma Territory. 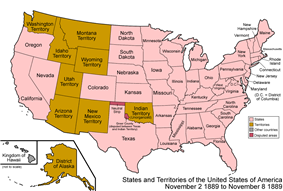 Utah Territory was admitted as the 45th state, Utah. The Kingdom of Hawaii became the Republic of Hawaii. 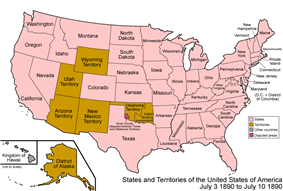 Wyoming Territory was admitted as the 44th state, Wyoming. Idaho Territory was admitted as the 43rd state, Idaho. Indian Territory, and included the Neutral Strip, and corresponded to the western half of present-day Oklahoma. Washington Territory was admitted as the 42nd state, Washington. 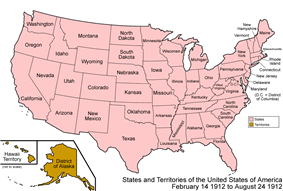 Montana Territory was admitted as the 41st state, Montana. 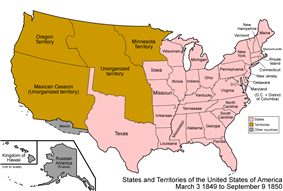 Dakota Territory was split in two, and it was admitted as the 39th state, North Dakota, and 40th state, South Dakota. The Department of Alaska, previously under the direct control of the federal government and the military, was redesignated the District of Alaska, forming a local government. The part of Dakota Territory south of 43° north and north of the Keya Paha and Niobrara Rivers was transferred to Nebraska. Colorado Territory was admitted as the 38th state, Colorado. The San Juan Islands were awarded to the U.S., formally ending the Pig War with Britain. The present-day Continental United States borders were defined at this point. 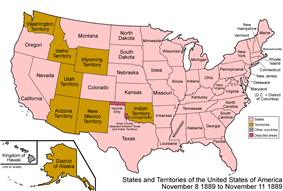 Wyoming Territory was formed from portions of Dakota, Idaho, and Utah Territories, corresponding to the present-day borders of Wyoming. The United States purchased Alaska from Russia; it was designated the Department of Alaska, and corresponds, except for a boundary dispute, to present-day Alaska. 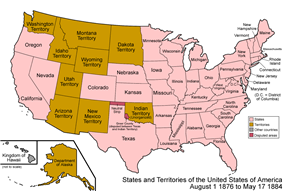 Nebraska Territory was admitted as the 37th state, Nebraska. 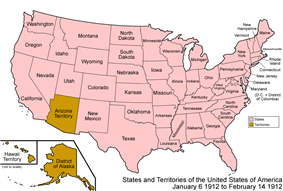 The northwestern corner of Arizona Territory was transferred to the state of Nevada, giving it its present-day borders. Nevada's eastern border was moved from the 38th meridian west from Washington, to the 37th meridian west from Washington, transferring land to it from Utah Territory. The main army of the Confederate States of America surrendered, and the Confederacy dissolved soon afterward. Much of the Confederate States' territory had already been retaken by force of arms prior to this point and the process of Reconstruction and readmission to the union would take several years following the Confederacy's collapse; to simplify the map, the former Confederate states are shown as already readmitted. To view a detailed animated map depicting the various state readmissions during Reconstruction see CSA states evolution. 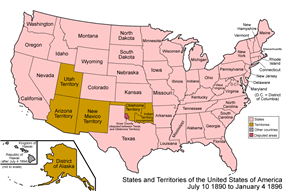 Nevada Territory was admitted as the 36th state, Nevada; it was a bit smaller than it is today, lacking area in both the east and south. Montana Territory was split from Idaho Territory, which also had some land transferred to Dakota Territory. Montana Territory corresponded to present-day Montana, Idaho Territory consisted of Idaho and western Wyoming, and Dakota Territory included both North and South Dakota, and most of Wyoming. The counties of northwestern Virginia (whose population had opposed secession from the Union and established a pro-Union state government) were split off and were admitted as the 35th state, West Virginia. The new state had been mostly under Union control since late 1861, but is not recognized by the Confederate and state governments in Richmond. Idaho Territory was created from portions of Washington, Dakota, and Nebraska Territories, consisting of present-day Idaho, Montana, and most of Wyoming. Nebraska and Washington Territories were left corresponding to their present-day counterparts. The Union created its own Arizona Territory, splitting it off from New Mexico Territory, making both territories correspond to their present-day states, except for Arizona Territory including the southern tip of present-day Nevada. Due to its nature as a mining and grazing area, land started to be added to Nevada Territory to accommodate these activities. Its eastern border was moved eastward from the 39th meridian west from Washington, to the 38th meridian west from Washington, transferring the land from Utah Territory. The Arizona and New Mexico. Minnesota Territory. 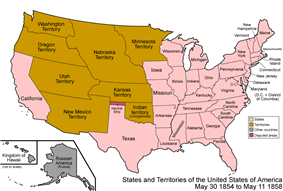 Dakota Territory consisted of both present-day North and South Dakota, as well as most of Montana and northern Wyoming. Nebraska Territory consisted of all of Nebraska and southeastern Wyoming. 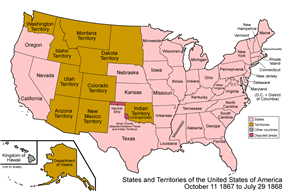 Nevada Territory was split from Utah Territory, corresponding to northwestern present-day Nevada; the eastern border was the 39th meridian west of Washington, D.C.
Kansas Territory. It occupied present-day Colorado. 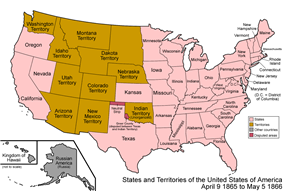 The eastern tip of Washington Territory and the northeastern tip of Utah Territory were transferred to Nebraska Territory. The Confederate States of America (CSA) was formed. The Southern states seceded at different dates and joined the CSA at different dates; to simplify the map, only the final form of the CSA is shown here. There were rebel governments as well as Union governments in Kentucky and Missouri, and the CSA had full control over Indian Territory. To view a detailed animated map depicting the various state secessions see CSA states evolution. The eastern portion of Colorado Territory was created on February 28, 1861. The western portion of Oregon Territory was admitted as the 33rd state, Oregon. The remainder was assigned to Washington Territory. Indian Territory. Kansas Territory consisted of present-day Kansas and eastern Colorado. Nebraska Territory consisted of present-day Nebraska, and parts of Colorado, Montana, North Dakota, South Dakota, and Wyoming. Indian Territory corresponds to eastern Oklahoma. The Gadsden Purchase added some land to New Mexico Territory, corresponding to the southernmost areas of present-day Arizona and New Mexico. With the purchase, the territorial extent and external borders of the present-day Contiguous United States are established (unless the San Juan Islands of present-day Washington state are included – see below). Washington Territory was split from Oregon Territory, consisting of present-day Washington, northern Idaho, and the western tip of Montana, leaving Oregon Territory with all of Oregon, southern Idaho and a portion of Wyoming. Minnesota, and eastern portions of North Dakota and South Dakota. Idaho, northwestern Montana, Oregon, Washington, and western Wyoming. In the Treaty of Guadalupe Hidalgo, which ended the Mexican-American War, Mexico surrendered an area that became known as the Mexican Cession: the Texas-claimed areas as well as a large area of land consisting of all of present-day California, Nevada, and Utah, most of Arizona, and portions of Colorado, New Mexico, and Wyoming. The District of Columbia retroceded its land south of the Potomac River back to Virginia. Congress passed the retrocession act on July 9, 1846, and Virginia took possession of the land on this date. Californio resistance to U.S. forces in California ended with the Treaty of Cahuenga. U.S. Army of the West (1846) under Stephen Kearny captures New Mexico and claims it for the U.S. He installs a U.S. military government of New Mexico under the Kearny Code and later a provisional government of New Mexico, subject to the federal government and not to Texas. The Republic of Texas was admitted as the 28th state, Texas. The United States Congress passed the joint resolution of annexation on March 1, 1845, but Texas did not agree to join the union for some time after. Although the annexation resolution avoided specifying Texas's boundaries, the U.S. inherited Texas's unenforced claims to South Texas, West Texas, over half of New Mexico, a third of Colorado, and small parts of Oklahoma, Kansas and Wyoming. With Texas joining the union, Arkansas finally gave up its claim on Miller County. Florida Territory was admitted as the 27th state, Florida. 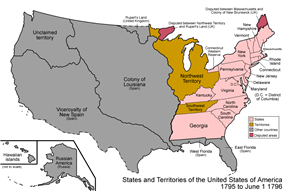 The Webster–Ashburton Treaty settled the border between the United States and lands held by the United Kingdom east of the Rocky Mountains, ending the disputes over the northern border of the state of Maine and northeastern border of Wisconsin Territory, which was in present-day Minnesota. Iowa Territory was split off from Wisconsin Territory, consisting of present-day Iowa, western Minnesota, and eastern North Dakota and South Dakota, leaving Wisconsin Territory with northeastern Minnesota and Wisconsin. The Platte Purchase added a small area of land to Missouri, giving it its present-day boundaries. Michigan Territory was admitted as the 26th state, Michigan. Wisconsin Territory was split off from Michigan Territory, consisting of present-day Wisconsin, Minnesota, Iowa, and eastern North and South Dakota. As an inducement to give up its claim over the Toledo Strip to Ohio, the whole of the present-day upper peninsula was assigned to Michigan Territory, giving it the present-day borders of Michigan. Arkansas Territory was admitted as the 25th state, Arkansas. It continued to claim Miller County, with increasing irrelevance. 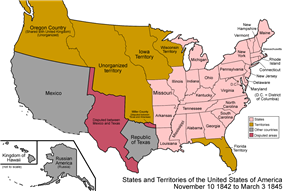 The Republic of Texas declared independence from Mexico, claiming a Rio Grande boundary encompassing present-day West Texas, the majority of New Mexico, and portions of Colorado, Kansas, and Wyoming. Actual control extended over approximately the eastern half of present-day Texas. Miller County in Arkansas Territory now intruded on the borders of Texas, and the people there began to take a Texian identity, leading to both governments having representatives from the county. A large portion of unorganized land was added to Michigan Territory, corresponding to present-day Iowa, western Minnesota, and eastern North Dakota and South Dakota. Russo-American Treaty of 1824 gave Russian claims south of parallel 54°40′ north to the United States. This and the Anglo-Russian Convention of 1825 leave Britain and the U.S. as the only claimants to Oregon Country. Russia retained Fort Ross, California until 1841. Florida Territory, which corresponded to present-day Florida. Around this time, the official spelling of Arkansaw Territory became Arkansas Territory. The Viceroyalty of New Spain achieved independence as Mexico. Spanish Texas became Mexican Texas. Ukase of 1821 attempts to forbid non-Russian ships from approaching the Northwest Coast. Only attempt at enforcement is seizure of the U.S. brig Pearl in 1822. U.S. reacts with the Monroe Doctrine in 1823. The southeastern corner of Platte Purchase. The Adams-Onís Treaty or Transcontinental Treaty came into effect, establishing a defined border between the United States and New Spain. The treaty ceded Spain's claims to Oregon Country to the United States and American claims to Texas to Spain; moved portions of present-day Colorado, Oklahoma, and Wyoming, and all of New Mexico and Texas, to New Spain; and all of Spanish Florida to the United States. The new borders intruded on Arkansaw Territory's Miller County, created on April 1, 1820, which dipped below the Red River and into land now ceded to Spain. However, the remoteness of the region caused no serious conflict with Spain. The Maine District of Massachusetts was split off and admitted as the 23rd state, Maine, as part of the Missouri Compromise. The northern border of Maine was not settled until 1842. 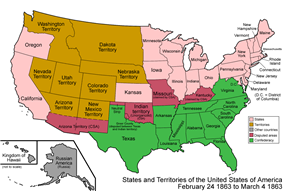 Alabama Territory was admitted as the 22nd state, Alabama. The southern part of Arkansaw Territory, consisting of present-day Arkansas as well as part of Oklahoma. It was not officially spelled Arkansas until later. The southern portion of Indiana Territory prior to the admission of Indiana as a state were also assigned to Michigan Territory. The Treaty of 1818 established the 49th parallel north west of the Lake of the Woods as the border with British-held lands, and Oregon Country was established as a shared land between the United States and United Kingdom. Oregon Country consisted of most of present-day Idaho and Oregon, all of Washington, and a portion of Montana, as well as the southern part of the Canadian province of British Columbia. 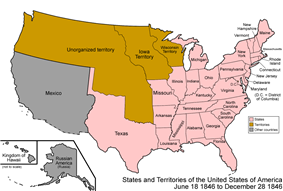 The treaty transferred the Red River Basin to the United States, consisting of northwestern Minnesota, northeastern North Dakota, and the northeastern tip of South Dakota. Mississippi Territory was admitted as the 20th state, Mississippi. Alabama Territory was split from Mississippi Territory; both correspond to their present-day counterparts. Republican Army of the North captured San Antonio, Texas, assassinated the governor Manuel María de Salcedo, proclaimed Texas an independent nation, and issued Texas's first constitution on this date. Spanish forces recaptured the province later that year and executed any Tejanos accused of having Republican tendencies. By 1820 fewer than 2000 Hispanic citizens remained in Spanish Texas. Louisiana Territory, having the same name as a state, was renamed to Missouri Territory. The federal government annexed a part of West Florida, the Mobile District, to Mississippi Territory, making the territory correspond to present-day Alabama and Mississippi. Most of the Territory of Orleans was admitted as the 18th state, Louisiana. The rest of the territory (the northwestern tip) was ceded to Louisiana Territory. By proclamation of President James Madison, the United States annexed the Baton Rouge and Mobile Districts of Spanish West Florida, declaring them to have been part of the Louisiana Purchase, in contravention of the retroceded Louisiana borders defined in the Treaty of San Ildefonso. One month earlier, these two districts had declared independence as the Republic of West Florida from a militarily weakened Spain. The U.S. Army seized control by threat of force in December after 74 days of that nation's independence. The Hawaiian islands are unified as the Kingdom of Hawaii. 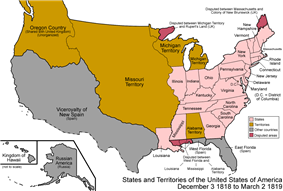 Illinois Territory was split from Indiana Territory. Illinois Territory included present-day Illinois, northeastern Minnesota, most of Wisconsin, and the western portion of the upper peninsula of Michigan. Indiana Territory included the present-day borders of Indiana, with its western and eastern borders continuing northward; thus, it also included the central portion of the upper peninsula of Michigan, as well as Door Peninsula of present-day Wisconsin. Michigan Territory was split from Indiana Territory, including the entire lower peninsula of present-day Michigan and the eastern tip of the upper peninsula. The split reinstated the upper peninsula border that had existed between Northwest Territory and Indiana Territory before Ohio's admission. The Territory of Orleans, which corresponded to part of present-day Louisiana with a small portion of Texas. The western border of Orleans Territory caused further conflict with New Spain, specifically over the region between the Sabine River on the west and the Arroyo Hondo (River) on the east, which became known as the Sabine Free State. This land was later confirmed as U.S. territory by the Adams-Onís Treaty of 1819. The unorganized land ceded by Mississippi Territory, consisting of the whole of present-day Mississippi and Alabama, minus their panhandles which were still part of West Florida. The Louisiana Purchase was made, expanding the United States west of the Mississippi River. The U.S. later had a dispute with Spain regarding whether France had included Spanish West Florida, located east of the Mississippi River, in the sale. West of the Mississippi, it was defined as the Mississippi Basin, whose extent was not known at the time and extended slightly north of the modern Canada-US border. It consisted of the whole of present-day Arkansas, Kansas, Iowa, Missouri, Nebraska, and Oklahoma, and portions of Colorado, Louisiana, Minnesota, Montana, New Mexico, North Dakota, South Dakota, Texas and Wyoming. It also included the southernmost portions of the present-day Canadian provinces of Alberta, and Saskatchewan. The southeastern portion of Northwest Territory was admitted as the 17th state, Ohio. The remainder of Northwest Territory was transferred to Indiana Territory. The secret Third Treaty of San Ildefonso retroceded from Spain to France, "the colony or province of Louisiana, with the same extent that it now has in the hands of Spain and that it had when France possessed it." Control was not actually transferred until the Louisiana Purchase. Connecticut ceded its Western Reserve to the federal government, which made it part of Northwest Territory, and is the northeastern part of present-day Ohio. Indiana Territory was formed from the western portion of Northwest Territory. It corresponded to present-day Illinois, Indiana, northeastern Minnesota, and Wisconsin, as well as the western half of the Lower Peninsula of Michigan and all but the eastern tip of the Upper Peninsula. Northwest Territory was left with only most of Ohio and the rest of Michigan. Due to the western land. The act created Mississippi Territory in the region ceded by West Florida, corresponding to roughly the southern third of present-day Mississippi and Alabama except their panhandles, which were part of West Florida. The Southwest Territory was admitted as the 16th state, Tennessee. 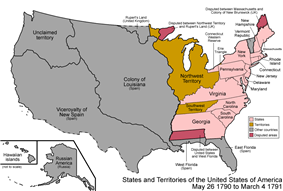 Pinckney's Treaty, also known as the Treaty of San Lorenzo, was signed on October 27, 1795, and proclaimed on August 3, 1796, settling the northern border of West Florida as the 31st parallel. In the third Nootka Convention Spain surrendered its exclusive claim to the entire Pacific Coast and acknowledged the right of Britain or other powers to use unoccupied territory. The western counties of Virginia beyond the Appalachian Mountains were split off and admitted as the 15th state, Kentucky. The federal government sold the Erie Triangle to Pennsylvania. The District of Columbia, the nation's federal district, was formed from land granted by Maryland and Virginia; the Virginia portion would be returned in 1847. The Vermont Republic, which had portions claimed by New York and New Hampshire and, while unrecognized by the United States, was a de facto independent country, was admitted as the 14th state, Vermont. The Southwest Ordinance organized the Territory South of the Ohio River, or Southwest Territory, which corresponded to present-day Tennessee.